Frank J. Williams is the retired Chief Justice of the Supreme Court of Rhode Island and is one of the country’s most renowned experts on Abraham Lincoln. He is the author or editor of over fourteen books; he has contributed chapters to several others; and has lectured on the subject throughout the country. At the same time, he has amassed an unsurpassed private library and archive that ranks among the nation’s largest and finest Lincoln collections. In 2000, the Chief Justice was appointed to the Abraham Lincoln Bicentennial Commission created by Congress to plan events to commemorate the 200th birthday of Abraham Lincoln in 2009. 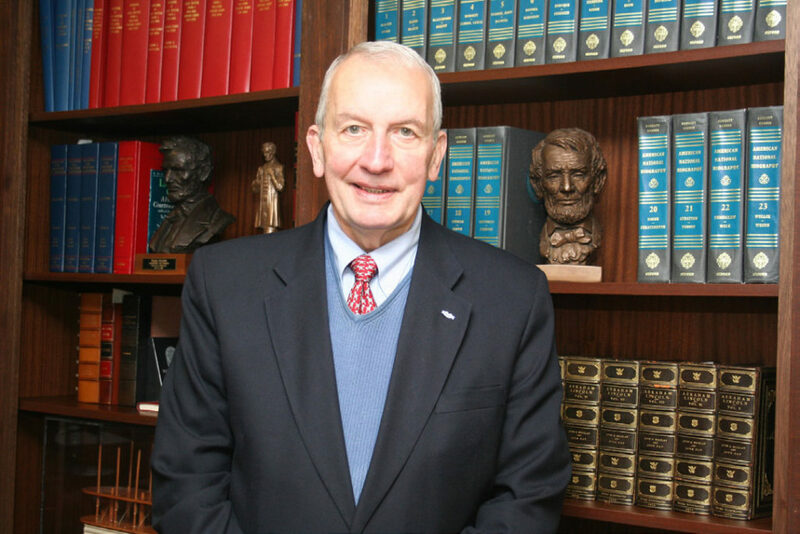 Since 1996, Chief Justice Williams has served as founding Chairman of The Lincoln Forum, a national assembly of Lincoln and Civil War devotees. For 9 years, he served as President of the Abraham Lincoln Association and, for 14 years, as President of The Lincoln Group of Boston. He is currently at work on an annotated bibliography of all the Lincoln titles published since 1865 for Southern Illinois University Press for which he is also writing Lincoln as Hero. His book of essays, Judging Lincoln, was published by Southern Illinois University Press in 2002. He, with Harold Holzer and Edna Greene Medford, has written The Emancipation Proclamation: Three Views, Social, Legal and Pictorial just published by Louisiana State University Press. His latest book, Lincoln Lessons: Reflections on America’s Greatest Leader, with William D. Pederson, was published by Southern Illinois University Press in 2009. He also serves as Literary Editor of the Lincoln Herald where his quarterly “Lincolniana” survey appears. He has been named by Lawdragon as one of the top 500 judges, out of 30,000 in the United States. The Chief also served in the U.S. Army from 1962-67 achieving the rank of Captain. For his service he was awarded the Combat Infantryman’s Badge, Bronze Star, 3 Air Medals and, from the Republic of Vietnam, the Gallantry Cross with Silver Star for Valor. On December 30, 2003, the President of the United States, through the Secretary of Defense, invited Chief Justice Williams to be a member of the then Military Commissions Review Panel for tribunals to be held in Guantanamo Bay, Cuba, with the rank of Major General. The Military Commissions Act of 2006 created the Court of Military Commission Review on which Williams served as a civilian appellate judge. He served as Chief Judge of the U.S. Court of Military Commission Review from November 21, 2007 to December 23, 2009.